nice brown trout from the other day. we were forced to nymph today below the dam. fishing was decent, but we definitely worked for our fish. micah and chris from up the hill came and fished. always a pleasure to have such good clients. we will be seeing them again for sure. 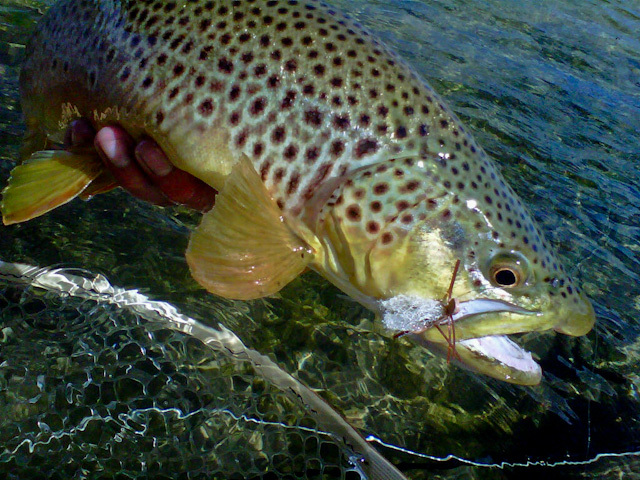 This entry was posted on Tuesday, August 17th, 2010 at 5:56 pm	and is filed under 307 Outfitters, big brown trout, big wyoming trout. You can follow any responses to this entry through the RSS 2.0 feed. You can leave a response, or trackback from your own site.